General Hospital (GH) spoilers tease that a shocking faceoff is coming up. Jason (Steve Burton) and Sonny (Maurice Benard) just barged into someone’s apartment after getting a lead from Spinelli (Bradford Anderson). They’re about to confront a female who received Dr. Obrecht’s (Kathleen Gati) last phone call. Since we know Britt’s (Kelly Thiebaud) back for a short stint, it looks like she’ll be on the hot seat. Dr. Obrecht apparently wanted to give her daughter the heads-up on Sonny and Jason’s search. She advised Britt to run, but the dynamic duo managed to catch up with her anyway. Dr. O’s warning brings up some interesting questions. Is Britt in the loop on Faison’s (Anders Hove) potential scheme? Was she part of it in some way? General Hospital spoilers say Jason and Sonny will hope to figure all that out. They’ll sit Britt down and demand some answers about Faison’s shady activities. GH fans can expect some tense moments in Friday’s episode. Britt will claim she doesn’t know anything, but Jason will go into Stone Cold mode and keep pushing. As Jason’s anger revs up, Britt will reiterate that she doesn’t have a clue what Faison’s been up to. 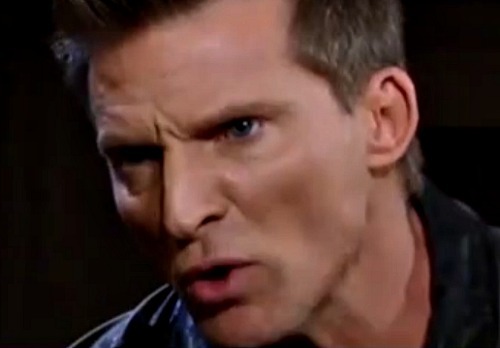 General Hospital spoilers say Jason will explode at Britt for keeping secrets. He’ll insist she knows something, so maybe he’ll wear Britt down eventually. There has to be a reason Dr. Obrecht alerted her to Jason and Sonny’s mission. Will Britt offer any hints that could point them in Faison’s direction? Britt must have some information or else GH wouldn’t have brought her back, nor would Dr. O have told her to run. However, the info probably won’t be exactly what Sonny and Jason are looking for. They won’t get solid evidence from Britt, but her hints could put them one step closer to Faison. Still, there’s no guarantee Faison’s the person they should be looking for. Sonny and Jason have been making a lot of assumptions about the mastermind. If Faison was going to be the true villain in all of this, then why not offer proof from the get-go? GH left the mystery open, so there seems to be more to the story here. It sounds like some major twists are in the works. The baddie behind the memory mapping study could come as a huge surprise to Jason, Sonny and everyone else involved. We’ll give you updates as other news comes in. Stick with the ABC soap and don’t forget to check CDL often for the latest General Hospital spoilers, updates and news.